Dimensions 0.25 by 4.25 by 7 in. Amazon.com description: Product Description: Experience and Education is the best concise statement on education ever published by John Dewey, the man acknowledged to be the pre-eminent educational theorist of the twentieth century. 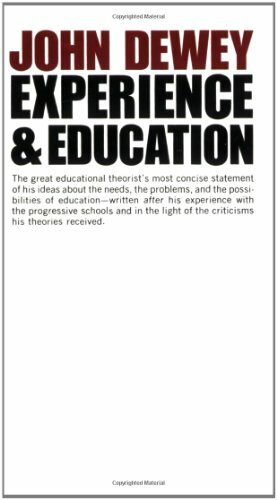 Written more than two decades after Democracy and Education (Dewey's most comprehensive statement of his position in educational philosophy), this book demonstrates how Dewey reformulated his ideas as a result of his intervening experience with the progressive schools and in the light of the criticisms his theories had received. Analyzing both "traditional" and "progressive" education, Dr. Dewey here insists that neither the old nor the new education is adequate and that each is miseducative because neither of them applies the principles of a carefully developed philosophy of experience. Many pages of this volume illustrate Dr. Dewey's ideas for a philosophy of experience and its relation to education. He particularly urges that all teachers and educators looking for a new movement in education should think in terms of the deeped and larger issues of education rather than in terms of some divisive "ism" about education, even such an "ism" as "progressivism." His philosophy, here expressed in its most essential, most readable form, predicates an American educational system that respects all sources of experience, on that offers a true learning situation that is both historical and social, both orderly and dynamic. About: Experience and Education is the best concise statement on education ever published by John Dewey, the man acknowledged to be the pre-eminent educational theorist of the twentieth century.